Renowned Argentine chef Francis Mallmann is an expert at cooking with fire: over it, under it, in it and around it. He invites writer Peter Kaminsky to a grilled feast (and impromptu poetry reading) at his country house in the Uruguay hills. Many chefs talk (and talk and talk) about a return to simplicity, but few have embraced this philosophy as completely as Francis Mallmann. He cooks with wood fire and cast iron at his three resolutely South American restaurants: 1884 Francis Mallmann, in the Argentine wine region of Mendoza; Patagonia Sur, in Buenos Aires; and the Hotel & Restaurant Garzon in Uruguay. But he hasn’t always focused on such basic methods. In fact, he became Argentina’s best-known chef at a young age by preparing haute-French food. “I could have gone on forever serving fancy French dishes to wealthy Argentines,” he says. Then, in 1995, he was asked to prepare a meal in a castle outside of Frankfurt for the esteemed L’Academie de Cuisine. “I think a guardian angel—a very Argentine angel, from remotest Patagonia—whispered in my ear,” he says. She suggested an entire menu featuring potatoes, South America’s great gift to the world’s larder. His cooking these days is largely based on wood fire. He utilizes every aspect of it, from the flames to the hot ashes. He describes the various methods in a new cookbook that I have written with him, Seven Fires: Grilling the Argentine Way. One of Francis’s favorite methods involves the chapa (a cast-iron griddle, also known as a plancha), because he loves how quickly the cooking surface heats up. He also often cooks with a parrilla (a barbecue grate) over live coals, the most popular method in Argentina and Uruguay as well as in the United States. 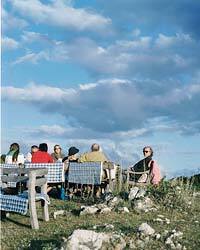 During my recent visit, he began the grilling on a hilltop above his house. We started drinking bracingly cold, sweet cocktails made with Campari and late-harvest wine. Dinner would come eventually. Much of Francis’s cooking defies precise scheduling, since fires and heating times vary so much depending on the place, the season, even the direction and force of the wind. But Francis does have one unshakable rule that defies the universal habit of constantly flipping food on the grill until it is done. “Once your ingredient comes in contact with the heat, don’t move it,” he said, placing a round of fresh goat cheese on a hot chapa set over the flames, where it bubbled and formed a crisp, golden-brown crust. “You must respect that first contact. Even if it’s not exactly in the right place, leave it alone. Otherwise, you will break the crisp surface that begins to form and dry out your food. Don’t touch!” he said, like a strict schoolmarm. He then carefully transferred the warm goat cheese to a thick slice of toast and spooned a spicy, briny olive mix on top. While we ate the griddled goat cheese, he placed a large, flat stone in the hot embers and let it sit for one hour. When he took the stone out, he beat the ashes off the surface with an old cloth, then set down thin slices of salmon. The fish emerged from a plume of smoke just a few minutes later, tender and deliciously charred; Francis served it atop sweet, crunchy corn cakes. Sometimes he uses a chapa instead of the hot stone, but he always cooks the salmon on one side only, to get both the smoky char and the fresh, clean taste of raw salmon. Demonstrating his “don’t touch” principle once again, Francis gently placed fluffy mounds of grated potatoes on the plancha for his version of rösti (fried potato cakes). While we waited—and waited—he told me true crunchiness requires cooking over low heat for a long time. Meanwhile, he grilled juicy skirt steaks on a parrilla, then served them with the cracklingly crisp, golden potatoes, tomatoes, and creamy, lemony mashed avocados. 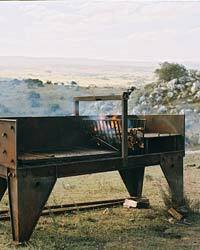 Peter Kaminsky collaborated with Francis Mallmann on Mallmann’s book, Seven Fires: Grilling the Argentine Way.